The sidewalk patch in front of the home of Jay Conners was done by the Borough. For the past several months, pedestrians walking along the 300 block of Rodman Avenue might have noticed a half-block of sidewalk dug out and cordoned off by yellow tape. The photo above taken last Thursday shows it patched with asphalt, something not allowed by borough code. 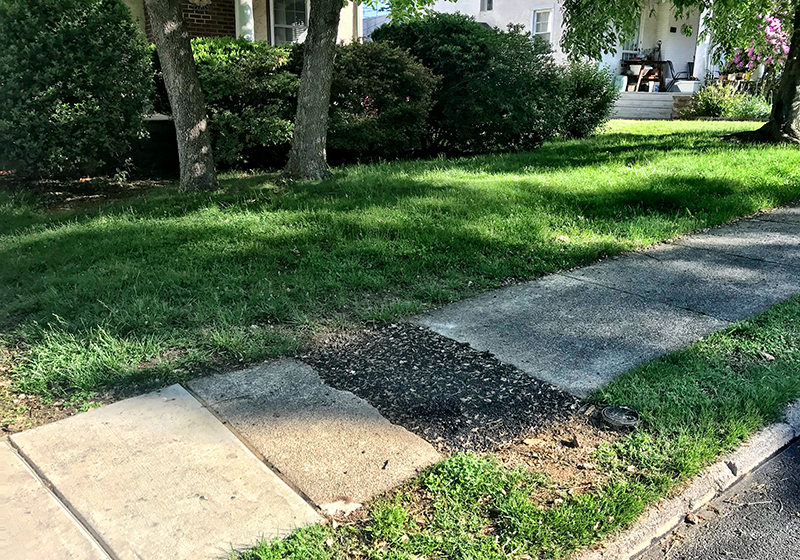 The property abutting this sidewalk belongs to Jay Conners, Borough Council Member, Chairman of the Public Works Committee, local Democratic party chairman, and a Friend of Sean Kilkenny. My water line broke and an emergency repair was done which involved breaking up my sidewalk. The contractor didn’t finish the job of patching the sidewalk. Someone complained to the boro that it was causing a safety hazard at which time the boro came out and patched the sidewalk which they do in all cases. At that time I told them that Joe Barricelli had been contracted to replace the sidewalk in the first or second week of June. One thing that Jay said is not true. Two years ago, I filed a complaint about this driveway apron. It is still not repaired. It belongs to Council Vice President and social media bully Rick Bunker. Two years ago about this time, I already had my first of two appearances at district court after receiving a citation from the borough for violating the sidewalk code. The judge pointed out that if we didn’t do the work, the borough could fine us $185 per day. We did do the work, but at the cost of about $3,000, or the equivalent of one brand-new, much needed furnace to replace the one installed during the Ford administration. Initially, we resigned ourselves to having the Borough do the work in exchange for a lien on our house as it stated in its initial letter announcing the sidewalk inspections. At the court hearing, George Locke told Judge McHugh that Council had decided that they would no longer do that, although Council never took such a vote. We were also told by Rick Bunker that municipalities do not perform sidewalk repair work for residents anywhere in Pennsylvania. Anywhere but Jenkintown and only for sitting council members, apparently. Do you trust George Locke to enforce a deed restriction?